Why Do My Transplanted Weigela Shrubs Have Leaf-Wilt? Why Do My Newly Transplanted Weigela Shrubs Have Leaf-Wilt? Plant roots draw water out of the ground and send it up through the above-ground parts of the plant. If the roots are damaged, the flow of water to the leaves is reduced. Wilting leaves can result. 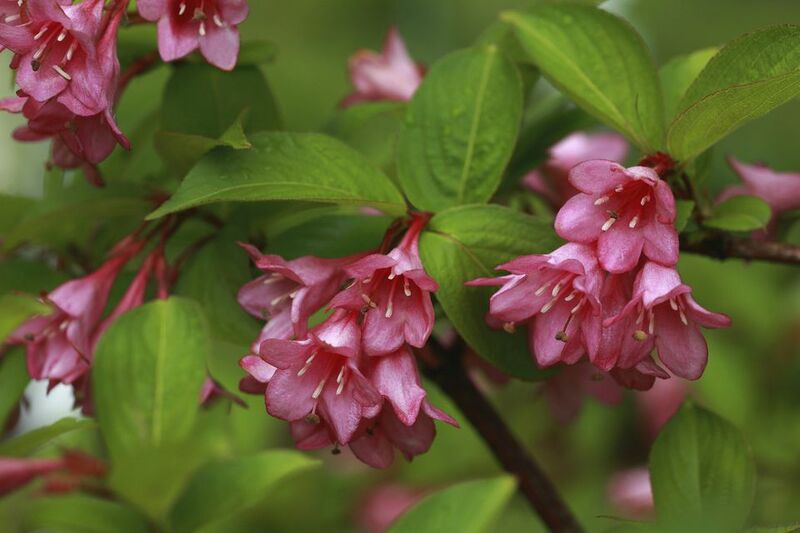 It is common when transplanting shrubs, including weigela shrubs, to cause transplant shock. The disturbed roots find it difficult to nourish the leaves with sufficient water in their damaged state, as the roots of a healthy, established shrub would. High winds simply exacerbate the problem: they have a drying effect that further robs the leaves of moisture. The result is leaf-wilt. Assuming that transplant shock is the reason behind the wilting leaves in your case, the positive actions you can take to help the weigela shrubs, at this point, are limited. Unfortunately, only forethought can prevent (or, at least, minimize) the effects of transplant shock. Windbreaks would have been effective (to shelter your weigela from drying winds). Likewise, you can prevent or minimize leaf-wilt by picking the best times to transplant. By avoiding transplanting at the hottest times of the year, you put less stress on the plants' root systems, thereby keeping them healthier. But the good news is that your weigela bushes are not dead: they just need time to recover. Here is what not to do: do not fertilize. Fertilizing would foster extra leaf growth -- which you do not want, since the weigela shrubs' disturbed roots are already struggling to support the current amount of foliage. Do water your weigela shrubs when the soil is dry, but do not overwater. When a plant's roots have been damaged (from transplant shock or any other source), they have to be given time to heal. Flooding a root system with water when that system is incapable of absorbing the water is, at best, useless and, at worst, counterproductive. Root damage can also be caused by digging too close to your plant while cultivating. For example, some gardeners will dig around a plant to remove weeds and accidentally sever roots in the process. You can largely avoid this problem by mulching. Others make the mistake of cutting into root systems when working compost or manure into the soil. Here the solution is to apply, instead, a compost tea or manure tea, which involves no digging. Again, once the damage has occurred, resist the temptation to combat the resulting leaf-wilt by overwatering (which will do no good). Finally, overwatering, itself can damage plant roots. The roots essentially rot and lose their ability to take up water. Adding more water in such a case can be like adding fuel to a fire. What if the Reason for Leaf-Wilt Is Not Root Damage? I have already mentioned a couple of alternate reasons for leaf-wilt, above. One is a soil fungus. Weigela shrubs are, in fact, one of the plants susceptible to the fungus, Verticillium wilt. According the University of Minnesota Extension (UVM), one way to identify this fungus is to look for "a scorched appearance" on leaf margins. To combat Verticillium wilt, UVM recommends selecting resistant plants and providing basic care (proper watering, fertilizing, etc.). That leaves one last cause of leaf-wilt, the one that most gardeners think of immediately: namely, lack of water. Yes, sometimes the reason is no more complicated than that the soil has dried out around your plant. If you do not see scorched leaf margins on your plant and have no reason to believe that root damage has occurred, you're lucky. Solving the problem is as easy as giving the plant a drink of water. Should You Hire a Pro to Do Your Landscaping Work? What Are Those Black Spots on the Leaves of My Magnolia Tree? Why Does My Magnolia Tree Have Browning Leaves? My Bradford Pear Trees Have Leaf Wilt. Is Wind Damage the Cause?